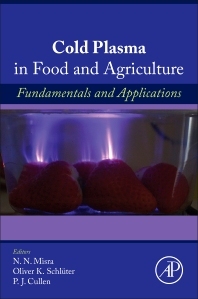 Cold Plasma in Food and Agriculture: Fundamentals and Applications is an essential reference offering a broad perspective on a new, exciting, and growing field for the food industry. Written for researchers, industry personnel, and students interested in nonthermal food technology, this reference will lay the groundwork of plasma physics, chemistry, and technology, and their biological applications. Food scientists and food engineers interested in understanding the theory and application of nonthermal plasma for food will find this book valuable because it provides a roadmap for future developments in this emerging field. This reference is also useful for biologists, chemists, and physicists who wish to understand the fundamentals of plasma physics, chemistry, and technology and their biological interactions through applying novel plasma sources to food and other sensitive biomaterials. Dr N.N. Misra is a food scientist at R&D, General Mills India. His research interests include cold plasma technologies for foods, food physics, and computational modelling. He has over 60 publications in international peer-reviewed journals, conference proceedings and edited books. He has several awards and fellowships to his credit, including the ASABE Rainbird engineering concept of the year (2014), Irish Research Council’s Embark Fellowship (2011) and Association of food scientist’s and technologists of India (AFSTI) gold medal (2010). Oliver Schlüter received his Ph.D. in food technology at the Berlin University of Technology. Since 2003, he is a senior scientist at the Leibniz Institute for Agricultural Engineering Potsdam e. V. (ATB). Dr Schlüter is the coordinator of the research program on “Quality and safety of food and feed”, head of the ATB working group on food safety and vice-head of the Department of Horticultural Engineering. His research work focuses on emerging technologies in primary food production (fruits, vegetables, milk, meat, edible insects) and fresh food processing (high pressure, plasma etc. ), optimisation and innovation of processing steps along the food chain of perishables, including quality and safety monitoring (fluorescence image analysis, flow cytometry, MALDI-TOF MS, etc.). PJ Cullen’s research interests include the development of novel technologies for the food and pharmaceutical industries. He spent 10 years at the Dublin Institute of Technology where he was team leader of the Process Analytical Technology group and the BioPlasma research group. He has published more than 100 journal articles and book chapters. His current research interests include the development of non-thermal plasmas for biological applications in food and medicine.